The terms “international” or “foreign” clients encompass two types of clients that real estate professionals may serve. 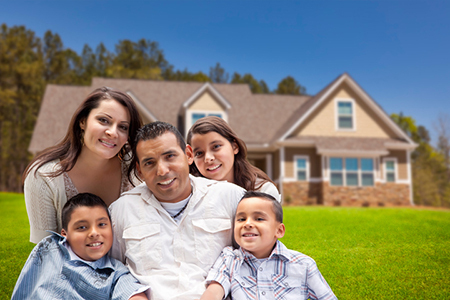 One type are non-resident foreigners, who are non-U.S. citizens with permanent residences outside the United States, and who typically purchase property for investment, vacations, or other short visits. The other type of foreign clients are resident foreigners who are non-U.S. citizens and are recent immigrants or temporary visa holders. Despite the slowdown in Chinese economic growth and tighter regulations on outflows of foreign exchange, Chinese foreign buyers remained as the top foreign buyer of U.S. residential property, according to NAR’s 2017 Profile of International Activity in U.S. Residential Real Estate. 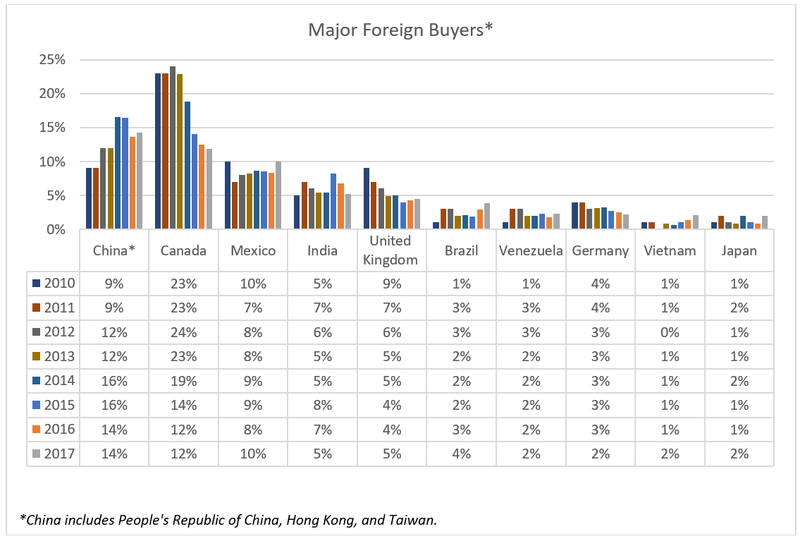 Chinese buyers accounted for 14 percent of all foreign buyers, followed by Canada (12 percent), Mexico (10 percent), India (5 percent), and the United Kingdom (5 percent). As the chart below shows, the percentage of Chinese buyers to all foreign buyers has considerably increased (9 percent in 2010 to 14 percent in 2017) while the combined share of Canadian and U.K. buyers has greatly decreased (32 percent in 2010 to 15 percent in 2017). Strong economic growth in China fueled by exports and foreign direct investments and the appreciation of the yuan from 2008 through 2015 likely account for the sharp increase in Chinese foreign buyer purchases. For the fifth consecutive year, Chinese foreign buyers were the top buyers in terms of dollar volume, purchasing $31.7 billion worth of residential property. Canadian buyers purchased $19 billion of residential property; U.K. buyers, $9.5 billion; Mexican buyers, $9.3 billion; and Indian buyers, $7.8 billion. 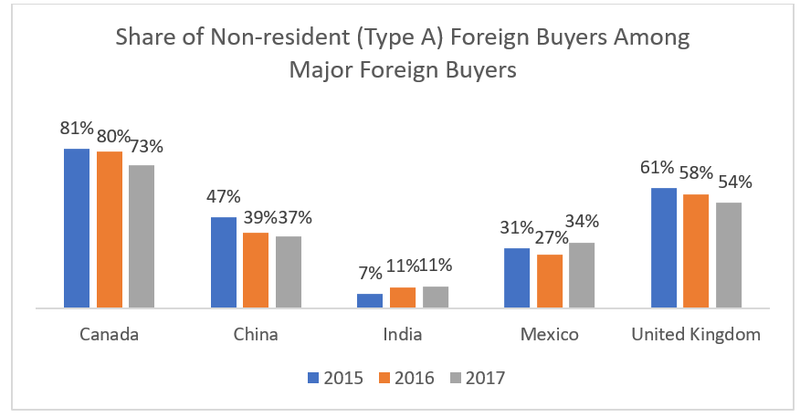 By type of foreign client, Chinese buyers, along with Asian Indian and Mexican foreign buyers, were mostly resident foreigners (buyers who are recent immigrants or in the United States on work, student, or other visas and who reside in the United States). Among Chinese buyers, the share of non-resident buyers declined somewhat, possibly because of tighter regulations on capital outflows from China. Canadians and U.K. buyers were mainly non-resident foreigners (buyers whose primary residence is abroad). Among Canadian and U.K. buyers, the share of non-resident foreign buyers decreased, which means a higher fraction of purchases came from resident foreign buyers. The decline in the share of non-resident foreign buyers among all U.K. and Canadian foreign buyers is likely related to the weakening of the pound (in the wake of the United Kingdom vote to leave the European Union) while stronger economic growth and slower growth in house prices may have drawn in more resident Canadian buyers. Respondents have reported fewer Canadian foreign buyers due to the weakening Canadian dollar, which has stabilized in the last year after weakening notably from 2014 to 2015. To learn much more about expanding your business internationally, consider taking one of the six individual international online courses or six online bundles developed by the Global Business and Alliances division of NAR. All of these online products can be used towards earning NAR’s Certified International Property Specialist (CIPS) designation. This entire month of August, all CIPS courses and bundles are 25% off at the Center for REALTOR® Development. Scholastica (Gay) Cororaton, research economist, writes about real estate market conditions and home-buying activity of international clients using data collected from the REALTORS® Confidence Index Survey, the Survey of International Home Buying Activity, and publicly available statistics. She has an MS in statistical science from George Mason University and a MA in economics from the University of the Philippines. She holds a Certified Business Economist (CBE) designation from the National Association for Business Economics. A version of this article originally appeared on NAR’s Economists’ Outlook blog.